What’s behind your Washing Machine? Most of us rarely look behind our washing machine to see what’s there. There usually are a few dust balls, that lost sock, and a toy or two. But there is also a hidden danger lurking back there that homeowners are not informed about. That is those vinyl or plastic hoses connecting the water supply to the washing machine. These are the hoses that come with the new machine and have a life cycle of less than 10 years on average. As they age, they lose their strength and leaks develop (fig. 2). A leak in one of these hoses can easily spew out 500 gallons of water an hour which would quickly flood a first or second floor laundry room or an entire basement. This could easily become a catastrophic loss for a homeowner. Some of the statistics indicate that washing machine leaks are one of the top 10 water losses insurance companies are involved in. One in 15 of these losses occur when the home is unoccupied. The homeowner is on vacation, out for the evening or at a child’s activity. In over 75% of the cases the washing machine hoses (which came with the washer) were less than 11 years old. Many laundry rooms have floor drains which seldom get used and plugged strainers or partial plugged drain lines. These cannot handle a potential leak of 500 gallons per hour. Some laundry rooms only have a drain pan under the washing machine. These can also have issues with restricted drainage capacity and they don’t even protect the hoses which are not over the drain pan. What are some of the options for the homeowner? One of the best options is to turn off your water at the meter if you are going to be away from the house for several days. This will protect you when you are gone from leaks at the washing machine and other parts of the house. Specifically for the washing machine the hoses should be replaced every 5 years. 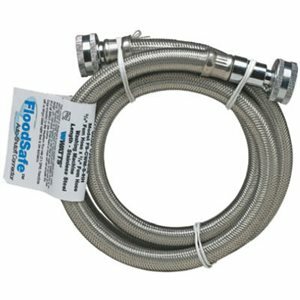 Today we have available stainless steel hoses with a patented “Floodsafe” option (fig.2). Be cautious of bargain brand hoses without this feature. They may be more prone to leaks than your old hoses and don’t have the “Floodsafe” option. 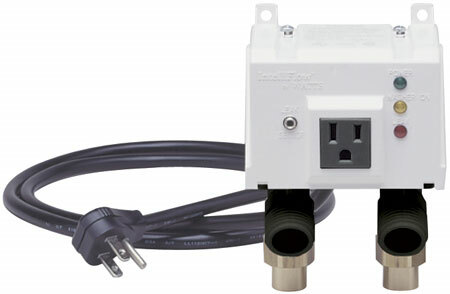 We also have available easy to operate shutoff valves for your washing machine water supply (fig. 3). For the best protection we have the patented “Intelliflow” device (fig. 4) that shuts the water off automatically unless the washing machine is operating. Yet another leak area at the washing machine is the drain hose. Although these don’t wear out as quickly as the water supply hoses, they do come loose from the drain piping and flood the laundry area or the drain line can become clogged and prevent the water from flowing properly. Check it regularly. Contact us for more information on these safety options. If your washing machine hoses are 5 years or older it may be time to consider replacing them with one of these safety options. Contact us for more information or visit our website at www.HomeServiceCorp.com. Home Service Corporation Celebrating our 32nd year serving our Michigan customers Heating & Air Conditioning , Plumbing and Electrical needs. Do You Need an Ark? Beginning in 2014, all piping, valves, fittings, and faucets used in drinking water systems must be lead-free that are used for water consumed by humans in the United States. What are the issues and what has already been done to protect the public? First, let’s look at the history of lead and drinking water. The definition of a plumber is a person who works with water pipes, once made from lead, or with lead solder for the joints. The Romans used lead pipes, and the word plumber comes from the Latin word for lead, plumbum. There is no Latin, or even Indo-European, etymology for plumbum but it bears a distant similarity to the Greek word for lead. Some historians believe the decline of the Roman Empire was as least partially caused by the abundant use of lead in piping, eating utensils, pots, pans and other uses. This is still an ongoing controversy. Lead piping was used for 2,000 plus years for drinking water distribution. 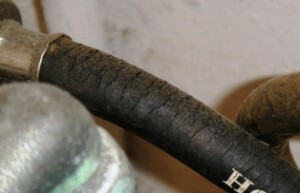 Lead was used for solder to connect copper piping when copper replaced lead in pipe material primarily due to cost. 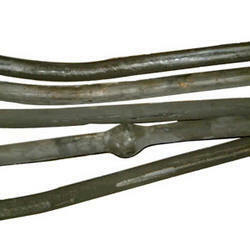 Prior to the 1960’s lead was often used for the water line from the city main into the home. In 1986 lead based solder for joining copper piping was banned. In 1988 all piping and fixtures were required to be lead free which required them to contain less that 8% lead content. So we have already had a significant reduction in the use of lead in our water supply system within a home. At present lead is either present in the systems of older homes or in the valves and faucets used in homes. 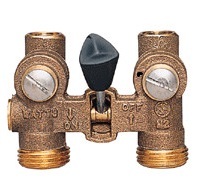 Those valves and faucets are made of brass which is an excellent material for this use when lead in the amount of 2% is added to the copper and zinc to improve the machinability. This is the area that lead is required to be removed from the drinking water distribution system. Manufactures of valves and fittings and faucets are approaching this challenge in several ways. Some are lining the water way through the valve, fitting or faucet with epoxies, plastics, stainless steel and other materials which are completely lead free. Some are building their products out of other materials such as plastic or stainless steel. Others are changing the components of the brass they are using to eliminate the lead content. If you have a lead water service in your home, replacement would be the very best option to reduce the chances of lead leeching into your drinking water supply. You will have valves, fittings and faucets in your home which will contain very small amounts of lead. Having your water tested would be a reasonable option. If these are not options because of cost or other obstacles then flush your pipes before drinking, and only use cold water for consumption. The more time water has been sitting in your home’s pipes, the more lead it may contain. Anytime the water in a particular faucet has not been used for six hours or longer, “flush” your cold-water pipes by running the water until it becomes as cold as it will get. This could take as little as five to thirty seconds if there has been recent heavy water use such as showering or toilet flushing. Otherwise, it could take two minutes or longer. Your water utility will inform you if longer flushing times are needed to respond to local conditions. As lead piping ages there is often a coating of calcium carbonate which provides significant protection from lead leeching into the water. These procedures may not be appropriate for your plumbing system; you should consult us to make sure these measures are sufficient to reduce the lead content to acceptable levels before implementing them. Home Service Corporation Celebrating since 1980 serving our Michigan customers’ Heating & Air Conditioning , Plumbing and Electrical needs.